Is it possible to sync iCal, Google Calendar, Outlook .etc, with Peek? Yes, Peek is synced with the iPhone event database for storing and reading the events. All the events that are visible in the built-in iPhone calendar should also appear in Peek. Is Peek supposed to be my primary calendar? it misses some features. 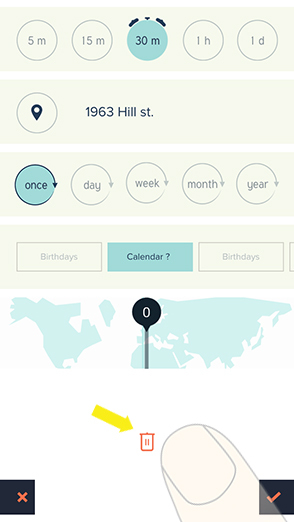 Peek is not designed for power users and therefore it is not meant to be the primary calendar app for this type of users. 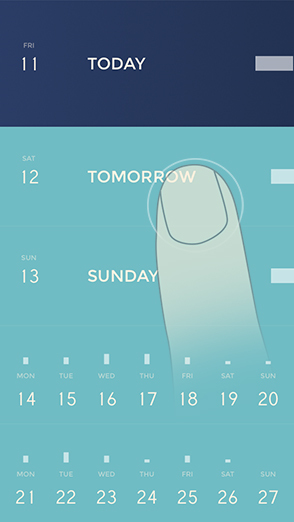 Peek is intentionally designed to be an easy to use calendar for mainly casual users. I just installed Peek but I don't see my events synced. what do I do? Please make sure you have the most updated version: 1.0.5. Sometimes iPhone does not give permission to access iOS event database for the first time, try to kill the app in the background and relaunch it, this should work. I am shaking the phone but I dont see any of those life events pop out. When I do the shading gesture, time does not show up on Peek. The shading gesture is off by default. You need to turn it on in the settings. 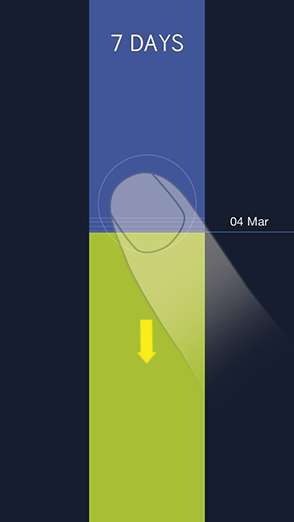 Sometimes at night time or in dark environments, the shading gesture is trigged and the time appears on Peek. 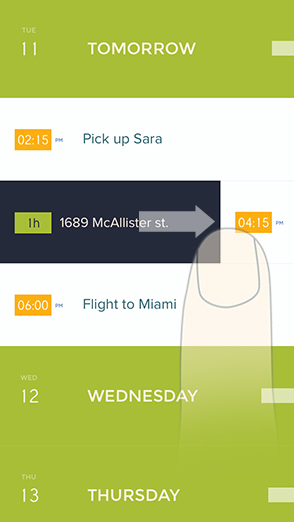 Shading gestures is designed to work in bright environments. We are working on improving detection algorithm so the time does not appear in darkness. How do I move events to other days? Is there anyway to change the date of an event? Currently Peek is not supporting this feature. You can either use the native iOS calendar to move events or delete and create the event on the new date. We are working on adding this feature in our next update. I don't see "Tomorrow" anymore. Do I need to change something? 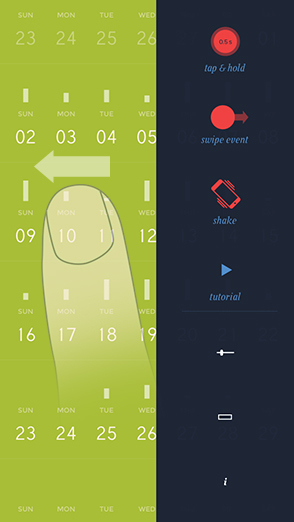 Peek only expands the days in the current week and month. If "Tomorrow" is the first day of the week or the first day of the month, it will be shown in the next week/month. Is there going to be an Android version too? We are working on an Android version but at the moment our priority is to make the iOS version better based on user's feedback. Swipe to left anywhere on the screen and the side menu slides in. You can get rid of the menu by swiping back to the right. Tap and hold for half a second on any day you want to add a new event to. Tap on the event to enter the edit mode. Swipe down to the bottom, delete icon is in the form of a trash can. Pull the duration picker down to the bottom and the blue bar appears. Pull down the blue bar to add days.